Soccer Ball Shape Address Sign - - personalized address number plaque is the approximate size of the traditional Size #5 ball. Wall mount. Holds up to three characters on one line. Made in USA. Address plaque in the familiar shape of a soccer ball is perfect for all soccer fans, soccer players, parents, and coaches. Customized with the address (or name if desired) you specify. You can even illuminate your address at night by installing our wall-mount solar light above the sign. See light in related products (part 64600F). Can be staked into lawn with optional 24" Comfort House lawn stake in related products (part CGS24001). Note: the style number you see on the sample sign (in this case CSSB09) is for internal use only and is not part of your custom sign. 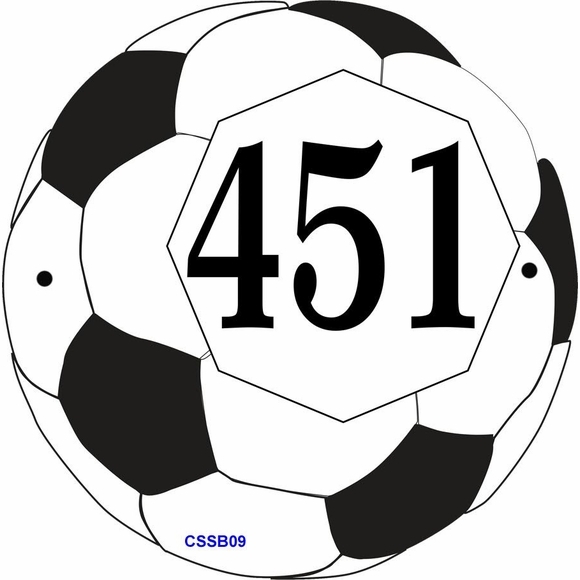 Comfort House exclusive laminated acrylic soccer shape house number sign. Crafted in the USA by skilled artisans to assure the highest quality. Soccer ball not big enough to hold all the characters in your address or name? No problem. We may be able to supply this sign to meet your requirements. Please contact customer service with your specifications for a quotation (customerservice@comforthouse.com).